Republican Greg Gianforte prepares to go onstage at a hotel ballroom to thank supporters after winning Montana's sole congressional seat, May 25, 2017. The Republican candidate for a U.S. congressional seat in (the western U.S. state of) Montana who was charged with assault after he allegedly grabbed a reporter by the neck and threw him to the ground, has apologized for his actions after defeating his Democratic opponent. "Last night I made a mistake. I took an action that I can't take back and I'm not proud of what happened," said Greg Gianforte, a multimillionaire. "I should not have responded in the way that I did and for that I'm sorry." Less than 24 hours after the incident, Gianforte narrowly beat out singer and poet Rob Quist Thursday, upholding the Republican Party's 20-year lock on the state's only seat in the U.S. House of Representatives. On Wednesday, journalist Ben Jacobs of the British-based newspaper The Guardian tweeted that Gianforte "just body-slammed me and broke my glasses" at the candidate's campaign headquarters in the city of Bozeman, just hours before the special election that Gianforte had been favored to win in the rural, heavily Republican state. About a third of Montana's voters had already cast their votes in the early voting process when the incident occurred. The special election was being held to replace Republican Ryan Zinke, who resigned earlier this year to become President Donald Trump’s interior secretary. 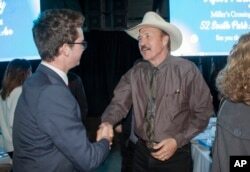 FILE - Congressional candidate Rob Quist meets with supporters during the annual Mansfield Metcalf Celebration dinner hosted by the state's Democratic Party in Helena, Mont., March 18, 2017. As word of the incident spread throughout the state, three of Montana's largest newspapers rescinded their endorsements of Gianforte. The Billings Gazette said it was “at a loss for words” over the allegations. The House Republican leader, Speaker Paul Ryan, said Gianforte "should apologize. There's no call for this under any circumstance." Ryan said that "if he wins, he's been chosen by the people of Montana." The House minority leader, Democrat Nancy Pelosi, described Gianforte as "a wannabe Trump. That's his model, Donald Trump." The Guardian posted Jacobs' audio recording of the incident, which occurred as the reporter was seeking Gianforte's reaction to a Congressional Budget Office analysis of the House Republicans' health care bill. After Gianforte initially refused to answer Jacobs' questions, a loud crash was heard, followed by Gianforte angrily screaming at Jacobs and ordering the reporter out of the room. Gianforte's campaign issued a statement accusing Jacobs of "aggressive" behavior when he shoved a recorder in the candidate's face and asked "badgering" questions. According to the statement, when Gianforte tried to grab the recorder, Jacobs grabbed Gianforte's arm and forced both of them onto the floor. But Fox News reporter Alicia Acuna, who was at Gianforte's headquarters to interview the candidate and witnessed the incident, posted a full-length story on the channel's website saying Gianforte grabbed Jacobs by the neck, “slammed” him to the ground and punched him. Acuna wrote that "at no point did any of us who witnessed this assault see Jacobs show any form of physical aggression toward Gianforte." Another reporter in the building, BuzzFeed's Alexis Levinson, tweeted that she saw, "Ben's feet fly in the air as he hit the floor." Jacobs suffered minor injuries and was taken to a hospital for treatment. The local sheriff’s office was called to the scene to investigate, and later issued a statement saying there was enough evidence to cite Gianforte with misdemeanor assault. If convicted, Gianforte would face a maximum $500 fine and six months in jail. Gallatin County Attorney Marty Lambert told Reuters news agency that Gianforte could face additional, more serious charges once prosecutors review the evidence.